The Sage of the Six Paths (六道仙人, Rikudō Sennin) was a legendary person who founded the arts of ninjutsu and started the ninja world. He defeated the Ten-Tailed Beast and sealed it within him thus becoming the first jinchūriki. The Sage was a priest who appeared long ago in an age of endless war. He was the first to explain the truth about chakra and tried to use his power and wisdom to lead the world to peace instead of war. The Sage traveled throughout the world, spreading his ideas and religion, the Shinobi Sect (忍宗, Ninshū), which eventually came to be known as ninjutsu. His great deeds and true desire to bring peace to the war-torn world led him to become widely known as the Savior of this World (この世の救世主, Kono Yo no Kyūseishu). Centuries before the beginning of the main storyline, the Sage defeated the most powerful demon in the ninja world, the Ten-Tailed Beast. 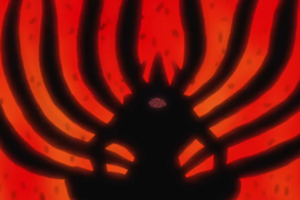 In order to protect the world from the Ten-Tails, the Sage developed an unknown sealing technique to seal the beast within himself, allowing him to harness and control its terrifying power, and making himself the first jinchūriki. Although he had successfully sealed the Ten-Tails, its power was so great that the seal would break after the Sage's death. Aware of this, the Sage used his Creation of All Things (万物創造, Banbutsu Sōzō) ability to divide the Ten-Tails' chakra into nine parts, which would become known as the tailed beasts. He then used Chibaku Tensei to seal the Ten-Tails' body inside a gigantic stone prison in the sky, thus creating the moon. The Sage would leave behind a tablet for his descendants which details his history with the Ten-Tails. Only those who possess the Rinnegan can fully decipher what is written on the tablet, while a person with a different dōjutsu can still partially interpret the information. Although depicted only as a silhouette, several details can be inferred about the Sage's appearance. He had long, spiky hair flowing backwards, in a style similar to Madara Uchiha's. 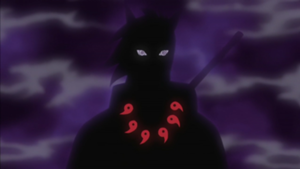 He wore what appeared to be a cloak with a high open collar or armor similar to that worn by Hashirama Senju, showing his necklace with six red magatama, similar to the one worn by Nagato's Deva Path. He seemed to have had horns on his forehead; this could have been a forehead protector similar to the one worn by Jiraiya or, if the outline of Naruto Uzumaki's controlled jinchūriki form is an indication, it might have been part of his hairstyle. The Sage was revered as the man to first understand the very nature of chakra itself. This wisdom, combined with his kekkei genkai, the Rinnegan, allowed the Sage to create the first modern ninjutsu. With such powers at his disposal the Sage obtained a huge following, as men and women from across the world strived to learn from his teachings. As the Sage's disciples grew continuously greater in number it led to the creation of ninja clans, and later, ninja villages. It is impossible to overestimate the Sage's effect on the course of the ninja world's development. As the first true ninja, he created the ninja world, revolutionized it, and left it forever changed. The Sage was shown carrying two objects. One was what appeared to be a large katana in his hand, whilst the other was a shakujō, a Buddhist ringed staff which is meant to be used in prayer, but can also be effectively employed as a weapon.